Upstate Real Estate Guide — Country House Realty: Fine Catskills and Upstate New York real estate, including Sullivan Co. and Ulster Co.
Crawling out from under the two themes that have dominated coverage of The Catskills for decades: "Former Borscht Belt" and "Quest for a casino," it appears the area may have reached a tipping point, and is now in the good graces of the travel media. Judging by the somewhat sudden, rising tide of articles and top rankings that The Catskills has received over the last couple of months, and from top-tier publications, no less, Sullivan and Ulster Counties are in for a fun ride. There are a number of hot new boutique hotels, including Phoenicia’s Graham & Co., that are receiving consistent coverage, including in Travel + Leisure's Best Places to Travel in 2015. But happily that piece does venture to my particular area of the region, citing The Arnold in its praise, a hip reinvention of the former Lanza's Country Inn in Livingston Manor, which is the latest venture from the folks who lost The Lazy Beagle pub and restaurant in a freak explosion a few years ago. Coming in at #39, The Catskills just appeared in this Sunday's New York Times Travel Section among the Top 52 Places to Go in 2015, while Fodor's places The Hudson Valley and The Catskills on their Go List 2015 (we are alongside The Arctic, it should be mentioned). The lesser-known of the three largest ski mountains (Hunter and Windham being the other two) in The Catskills, Belleayre, received huge kudos by landing on Condé Nast Traveler's Twelve Underrated Ski Resorts in America: Readers' Choice. It should be mentioned that the main stream media is following a trend that began with bloggers and even print publishers, in identifying this 2-3 hour remove from, particularly, Manhattan and Brooklyn, as THE get-outta-Dodge destination for the stylish and hip. 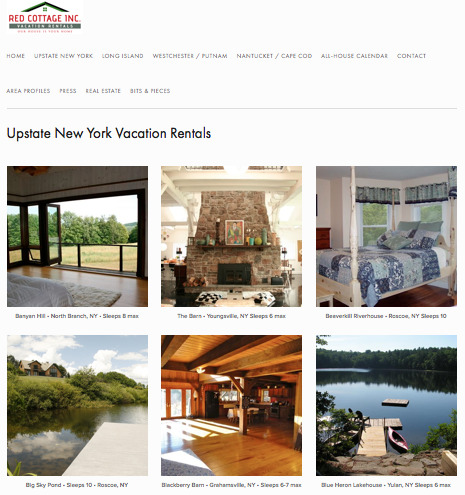 And with a vacation rentals company, Red Cottage Inc., that offers cool properties, most owned by these creative urbanites, and rented to similar-minded folks, we've seen the level of interest in, and excitement about, The Catskills soar over the last couple of years. The energy self-perpetuates as they inject local communities with their ideas, businesses and investment. Green Door Magazine, alas, closed its doors last year, but covered the colorful and creative people and places populating the Sullivan County area. And they coined the frequently used phrase "Hickster," which really does accurately portray that Brooklyn cool meets Upstate flannel population of weekenders who are buying and visiting in increasing numbers. The award-winning Watershed Post is more news outlet than travelogue, but is one with a refreshing human-interest angle as well. It's replaced the role of the largely defunct "local paper", and provides a wider canvas for Catskills coverage. The Upstater website is popular with "down-staters" interested in exploring their real estate options for a country house. 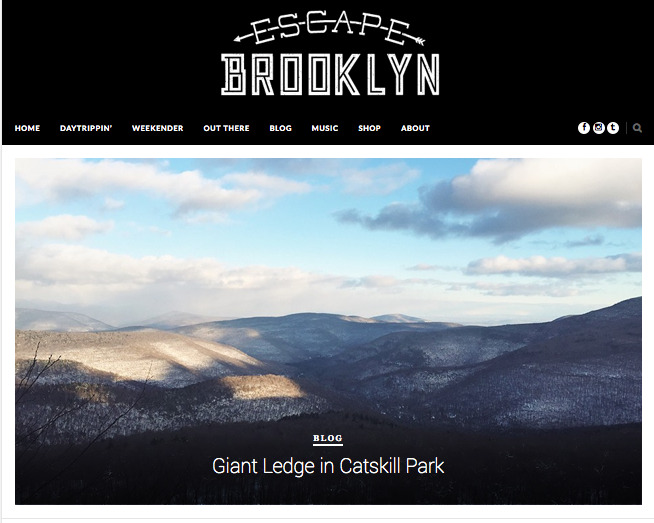 With comprehensive write-ups and fab photos, Erin and Denny, the bloggers at Escape Brooklyn, have a huge following, documenting their Upstate sojourns, and developing not only a network for themselves, but for those of us who follow them. Case in point: follow their Instagram postings, and you'll learn about so many other interesting ventures, high-energy people, and creative efforts, that these counties seem to come alive with an energy that has clearly resulted in what we're seeing reflected in the wider press today. tags: travel press, hickster, watershedpost, escape brooklyn, green door magazine, red cottage inc, new york times, travel + leisure, conde nast traveler, Graham & Co. In 2005 I bought my house on the border of Sullivan County as a weekender, became a full-timer in 2007, and until last year I would cringe at the never-ending discussion about and reportage of the "casino question". It sounded distasteful and incongruous with the immeasurable natural beauty of the area. So with a decision being handed down, possibly this coming week, regarding the allocation of casino licenses, I'd like to point out some of the lesser-known, and frankly, quite exciting, features of what could come to pass in our back yard. If you live in or around Sullivan County, you’ll know that the quest by various parties to have a casino has dominated the political landscape for decades. What was once a contentious issue was embraced last year via referendum resulting in the State’s authorization to issue seven casino licenses. Our region, the Catskill/Hudson Valley Region should be issued two, but the big question is where. And should we receive a casino in Sullivan County, what’s planned at the resort? The answer to the latter is: quite a lot. Sullivan County looked to be sitting pretty to receive one until a number of casino operators presented proposals south of us in Orange County. As a result, two of the projects in Sullivan Co. were not able to secure financing, the likelihood of metropolitan vacationers passing a casino in Orange to continue another hour to Sullivan, creating a challenging environment for success up our way. That has left us with two proposed projects, which ironically are next door to one another on the site of the former Concord Hotel. Louis Cappelli bought the Concord in the 1980s. Along the way, a company called EPR acquired about 1,700 acres from him, leaving Cappelli with around 170. Their competing proposals have Cappelli teamed up with Mohegan Sun, while EPR’s gaming partner is Empire Resorts, the operator of Monticello Casino & Raceway (an alliance formed before the enabling legislation). The other competitors within our region includes a project in Newburgh, which certainly has legitimate bragging rights in terms of economic distress, and more recently, the Nevele in Ellenville, just over the border from Sullivan in Ulster Co., has recently partnered up with a higher-profile gaming partner, making it that proposal another worthy possibility. But in a genius move about a month ago, Sullivan County decided to galvanize all their resources to push not only for one casino, but to boldly campaign for both licenses. They put together a well-orchestrated, professional campaign from all economic development organizations: Visitors Association, IDA, Chamber of Commerce, and the Partnership for Economic Development, and outlined compelling reasons why Sullivan should be granted both licenses. I watched the public outreach meeting, streamed live, and must say I was very proud of the image we presented. The numbers are quite staggering. I have no crystal ball to know how the project will fare long-term. But the investment, should the county get both licenses, would generate over 70 times the annual county budget in the two years it should take to get them up and running. That’s just a staggering amount of money to hit our area in a compressed period of time. And once up and running, a decent chunk of tax will go directly to local school districts. I was against the idea of casinos for years, until I came to recognize that the poverty, joblessness and educational needs here were such that simply creating a huge pool of new jobs on the derelict site of what used to be an economic powerhouse, would outweigh any not-in-my-backyard sentiment I might have. But now that more of EPR’s project plans (Montreign is the casino located within the larger project called Adelaar) are out in the public domain, I find myself really excited about amenities that I think will add substantially to my quality of life, and presumably to that of others. Some of these projects are dependent on both casinos being approved, but in addition to the EPR resort, would be a "Village" that incorporates entertainment, dining and retail areas, in addition to new housing. There would be a multiplex cinema, which means I would actually go to the movies. Presently we have one charming, old-school movie theater in Callicoon, but for many of us, it's 50 minutes to see a film. There would be an outdoor skating rink, tennis courts, and golf courses. We would have an array of big-name NYC restaurants (yearround, no less, since many of our restaurants limit wintertime operation) and a slew of opportunities for retail therapy. We’ll have access to more live music options via an entertainment venue, and there would be an organic farm and snow tubing. Should both projects go forward, the derelict site at Grossingers in Liberty would sport a new 150 key Spa/Golf Resort in Liberty. And I'm not even mentioning the massive water park. So like so many things in today's world, why offer one attraction when you can dazzle with dozens. Today's "casino" supplies gambling as just one of a host of diversions. I have come around to what I hope will be massive benefits to the county and its inhabitants, first and foremost, as an economic boost to an area that has had a hard time of it for too long. An ancillary bonus are the various amenities and luxuries that would be available to us as "locals". The NYS Gaming Commission is meeting next Friday, November 21, when they may or may not announce the winners of the licenses. But whenever the announcement is made, if you want to watch the big reveal, it will be streamed live on the NYS Gaming Commission website. Time TBD. Looking for more details? The access from Route 17 would be via the new East Broadway exit for Monticello, #106, with the entrance to the Montreign resort almost immediately off the ramp. Both projects already have planning permission. As I stoked the fire last night, following an afternoon of traipsing across Sullivan County with an intrepid couple up from the city, snow-be-damned, I recalled a blog posting from my early days as a full-timer up here in Claryville, which still holds true. I’m a sucker for snow, especially around the holidays. So with snow covering the skylights of my usually very bright house, it’s really quite cozy, with a nice fire burning to complete the scene. And the fact that for the last two days I’ve been chopping wood, I’m quite pleased with myself. In this part of rural Upstate New York, wood is a valuable commodity to many. Not just financially (I paid $155 a cord from the Frost Valley YMCA, which is about average, and bought 2 cords - ed. note: 2007), but as a way of life. End of summer/early fall conversation often includes earnest discussion: reliable sources, the going rate, the quality of the seasoning. Then follows talk of stacking. I recall someone’s wife earning high praise for her stacking ability. These are skills people value. Wood is right up there with food and water. After all, what is a house without “warm and dry”. It is not at all uncommon for people up here to use wood as a primary - if not exclusive - fuel for heating their homes. In the fall you’ll drive by properties where the house is barely visible for the bunkers of enormous piles of stacked logs recently delivered. So when spring comes, and the house is fully visible once again, you know it’s time for everyone to emerge from hibernation. I must confess, I wake up each morning and turn up that thermostat. I don’t go tropical, like my mother does in Westchester, but having lived in Ireland for eight years, I’ll never go back to that drafty, damp existence where my feet just never warmed up. My new favorite tool, however, is the “maul”. I think that’s how you spell it. The back of the blade is thicker and it’s heavier than an axe, but damn that thing splits wood well! It’s like when your golf club strikes the ball in the sweet spot, and you hear the perfect sound. The swing and SPLIT, the log falls in two. Throw that into the fire on a wintry day and you feel like you can get along in the world no matter what may come your way. Much more opportunity to wear snow shoes than Jimmy Choos. And frankly, a lot more fun. Apparently, this is called a maul. Whether to update or to renovate part or all of a house is a decision that often faces both buyers and sellers. Those looking to sell try to figure out if that investment will help sell their property, and if so, for how much of the cost will they be reimbursed at the closing table. At the same time, buyers are calculating what it’s worth to them to take on a property that requires work versus buying a similar property that already has those updates. There is the monetary element, but also the time and often uncertainty about local contractors, permits, zoning and the like. Obviously there are varying tolerances for renovation. Since my market is primarily the second home buyer, they are often particularly hesitant to take on a bigger project given the time and distance elements. So what does that mean for sellers? In my experience over the last few years, I have usually advised my sellers not to upgrade kitchens and bathrooms because tastes vary so widely, and because buyers are more comfortable dealing with countertops than the septic, for example. What sellers should focus on is minimizing the list of repairs/upgrades required for the house’s systems. Those elements can scare people who are more accustomed to apartments than houses. Recently I was chatting with a couple who lives in Long Island, and she mentioned that she put in a gorgeous kitchen to help sell her house, but lamented the fact that she had little time to enjoy it before handing over the keys to a new buyer. And this brings up the point that if you’re contemplating selling in the next few years, and your kitchen or bath could use an update, do it and enjoy it, with the knowledge that down the road it will likely help the marketing and sale of your home, although you might not fully recoup the cost. Squatters I came to know during a 2007 house flip. The information presented by Country House Realty, Inc. is deemed reliable, but is not guaranteed.